46 West George Street, Glasgow. G1 1DH. Tel: 0141 354 5164. 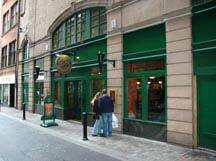 Waxy O’Connor’s was formerly Carnegie’s during the 80s and 90s.